Published: Dec. 23, 2018 at 05:10 p.m. The San Francisco 49ers' defense take advantage of Chicago Bears quarterback Mitchell Trubisky's miscue and recover the fumble. Published: Oct. 15, 2018 at 10:57 p.m.
San Francisco 49ers cornerback K'Waun Williams breaks up Green Bay Packers quarterback Aaron Rodgers' pass for a fourth-and-goal stop. 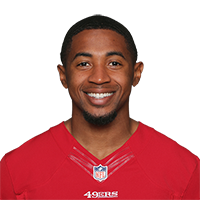 Published: Dec. 24, 2017 at 09:35 p.m.
San Francisco 49ers cornerback K'Waun Williams gets up for an incredible one-handed interception on a pass from Jacksonville Jaguars quarterback Blake Bortles.